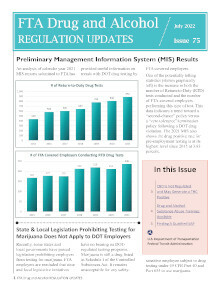 Sign up to be notified when FTA Drug and Alcohol Regulation Updates newsletters are published. FTA’s Drug Abuse Awareness Video is Now Available! Does Your Collection Site Perform Directly Observed Collections? Another Successful FTA Drug and Alcohol Program National Conference! 13th Annual National Conference Registration Available Soon! Another Successful FTA Drug and Alcohol Program National Conference on the Books! Daylight Savings Time: Make Sure Clocks were Changed! Reminder: Annual MIS Reporting Due March 15th! 11th Annual FTA Drug and Alcohol Program National Conference A Success! Ubers, Lyfts, and Ride-Sourcing: Do the Regulations Apply? Are Taxicab Companies Covered under FTA Drug and Alcohol Testing Regulations? Do My Contractors Fall under the FTA Regulations? Discovering the Return-to-Duty Process Was Not Followed—Now What to Do? Records Retention for Employers Offering a "Second Chance"
Does Airbag Deployment Constitute Disabling Damage? Officers Serving as BATs - Good Idea or Not? Tourist Trolley or Road Trolley? 10th Annual National Conference Registration Online Now! When Does A Drug or Alcohol Test Commence? Updating Drug and Alcohol Policies-"Public Transportation" vs. "Mass Transportation"
Previous DOT-Covered Employer Records - What Constitutes a Good Faith Effort? Post-Accident: What is the "Best Information Available"? Is Your EBT Compromising Your Compliance? Dispatcher/Scheduler/Call-Taker: When Do You Consider Employees Safety-Sensitive? Blood Alcohol Content Greater than or Equal to 0.02, but Less than 0.04 - Now What? Employers: Save Copies of Your MIS Submissions for Your Records! When Is a Self-Referral Too Late? Are Employees of Armored Car Guards Performing a Safety-Sensitive Function? When is "No" a "Test Refusal"? What Does It Mean to "Refuse a Urine Test?" 7th Annual Conference Another Success! When is a Vehicle in "Operation"? What is an "Accident"?